A bang up new bar occupying a sprawling space and having a several first of the city to its name, the 6,000sq ft Motor Works & Brewing Co is the hottest new place where we are checking in to get our spirits high. It sounds like a service station in Salt Lake involving cars, machines, mechanics and a wash somewhere brewing, but it's the most unusual name that you can think of a bar to have. So what does it mean for an incongruously located boozer on a traffic heavy crossing at Salt Lake? 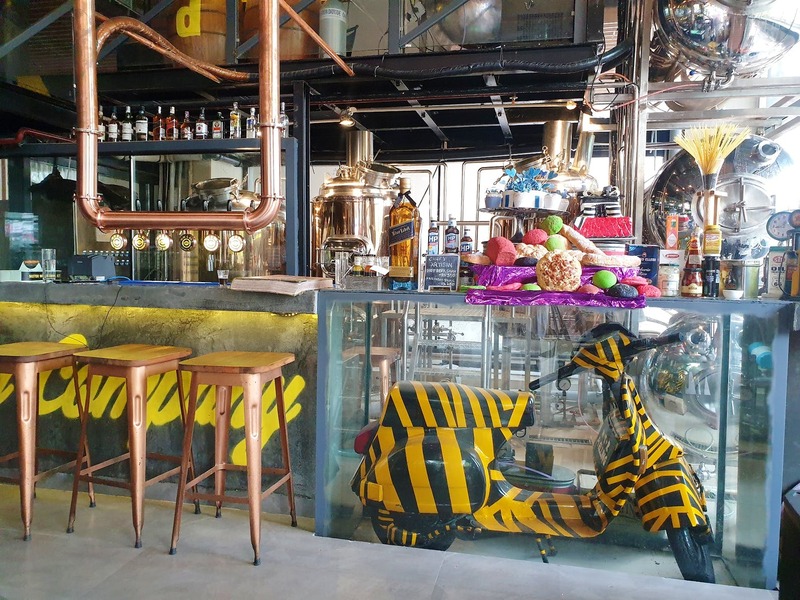 It means, antique motor parts strategically placed, cranks for table stands, intriguingly curious beer posters taking up space in the walls and the first of its kind (in the city) horizontal copper brewing tanks with a top dispenser piling you with top notch craft beer. When you have a chug score to be proud then this new bar is the place to pay homage to the barley and yeast gods. This bar takes up the ground floor of Salt Lake's popular drinking hole Bakstage. It is the first fully copper horizontal (which enables even distribution of yeast) brewery in the city - it's a treat to just be surrounded by all the brewing paraphernalia! They have developed six craft beers (from stout and lager to German and Belgian wheat and even an amazing apple cider) and more will come up to add to the list. You come in and you will be given a taster-sampler shots of the craft beers - you taste and choose what you want. Another first in the city, this new place has a Beer Up Table (or Pour Your Own Beer) that lets you fill your own glass (all you need to do is put your glass on top of the machine and it fills up by itself. This could definitely be your boozy gang's fave new spot! You book one of these tables (get a minimum of ten people with you) and run the show - have unlimited beer for two hours. Food is uncommonly good for a bar - a thoughtfully curated menu that grabs your attention right from the chakna (check out their Toolkit platter, it has a Sindhi munchy we fell in love with!) to beer-infused appetisers like an awesome Beer & Cheese soup and mains like Bunny Chow (a dish from South Africa where a loaf of bread serves as the bowl and is filled with either dal makhni, butter chicken or paneer). We are picky about places with good music because a poor playlist can really sully a good booze and great vibes. This place won't disappoint you, and if you've got a good ear you'd be loving the Asian underground tracks that keeps playing here. Look out for the fun postcard-size placards all over the place - especially one with Darth Vader singing the praise of beer! Look out for the beer keg-shaped trippy food truck (serves as a live kitchen) that comes out in the front and you can have a feast from it. Plans are afoot to send it around the area serving up delish bites!